Bacitracin Zinc Overdose is the accidental or intentional intake of compounds containing bacitracin zinc. What is Bacitracin Zinc Overdose? What are the Causes of Bacitracin Zinc Overdose? What are the Signs and Symptoms of Bacitracin Zinc Overdose? 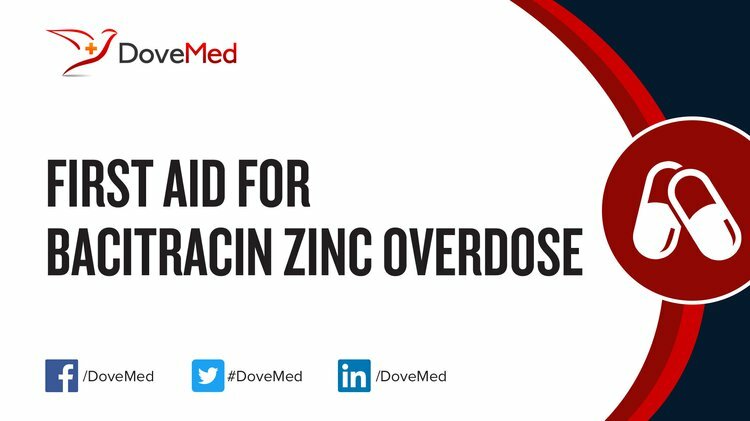 How is First Aid administered for Bacitracin Zinc Overdose? Who should administer First Aid for Bacitracin Zinc Overdose? First aid for Bacitracin Zinc Overdose is administered by healthcare professionals. What is the Prognosis of Bacitracin Zinc Overdose? How can Bacitracin Zinc Overdose be Prevented? Rashid, A., Brown, A. P., & Khan, K. (2005). On the use of prophylactic antibiotics in prevention of toxic shock syndrome. Burns, 31(8), 981-985. Basler, R. S., Hunzeker, C. M., Garcia, M. A., & Dexter, W. (2004). Athletic skin injuries: combating pressure and friction. The Physician and sportsmedicine, 32(5), 33-40. Moon, C. H., & Crabtree, T. G. (2003). New wound dressing techniques to accelerate healing. Curr Treat Options Infect Dis, 5(3), 251-260. Cromwell, G. L. (2002). Why and how antibiotics are used in swine production. Animal biotechnology, 13(1), 7-27. Leitsch, D. (2015). Drug resistance in the microaerophilic parasite Giardia lamblia. Current tropical medicine reports, 2(3), 128-135. Ness, M. J., Davis, D. M., & Carey, W. A. (2013). Neonatal skin care: a concise review. International journal of dermatology, 52(1), 14-22. Capitán-Vallvey, L. F., Navas, N., Titos, A., & Checa, R. (2001). Determination of the antibiotic zinc bacitracin in animal food by high-performance liquid chromatography with ultraviolet detection. Chromatographia, 54(1), 15-20. Choi, E. M., Kim, J. W., Pyo, M. K., Jo, S. J., & Han, B. H. (2007). Elimination of saturated fatty acids, toxic cyclic nonapeptide and cyanogen glycoside components from flax seed oil. Biomolecules and Therapeutics, 15(1), 65-72. Kaya, Ş., Kececi, T., & Haliloğlu, S. (2001). Effects of zinc and vitamin A supplements on plasma levels of thyroid hormones, cholesterol, glucose and egg yolk cholesterol of laying hens. Research in Veterinary Science, 71(2), 135-139. Siegmund, W., & Giessmann, T. (2002). Systemic Tolerance of Antiseptics Used in Ophthalmology. DEVELOPMENTS IN OPHTHALMOLOGY, 33, 57-65.